Purchase this product now and earn 40 Frequent Leaf Points! The Nailhead teapot features a pattern reminiscent of drops on the surface of water. Matte red finish on the outside with black enamel on the inside. This style of pot is well known amongst Zen students and followers. Includes a removable stainless steel mesh infuser for brewing pure leaf teas. Not intended for use on stovetop. 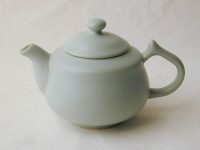 China is believed to be the origin of cast iron teapots. They were then adopted and further developed by the Japanese. They are popular due to their ability to distribute heat evenly and keep tea or water warm for a long time. Originally, cast iron teapots were used as kettles for boiling water. In Japan, these teapots, known as Tetsubin in Japanese, were transformed according to the aesthetic elements of Zen, and emerged in the last century as more of a tea service item. To make a cast iron teapots, wooden patterns are used to develop the design. Wood allows the artisan to intricately etch, carve, and shape the teapot. 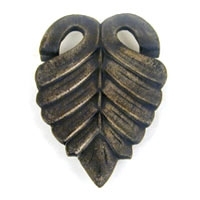 Next, the wooden patterns are converted into metal patterns (the use of the material varies as per the manufacturer), and subsequently to sand molds. Molten cast iron at 1600°C is poured into the molds to form the teapots. The cooled teapots are finished by hand to remove any imperfections. Purchase this product now and earn 25 Frequent Leaf Points! Purchase this product now and earn 48 Frequent Leaf Points! Winter (October 15 – March 14): 10 a.m. – 3:30 p.m.
Spring (March 15 – May 14): 10 a.m. – 5:30 p.m.
Summer (May 15 – October 14): 10 a.m. – 6:15 p.m.
We accept major credit cards: Visa, Mastercard, American Express, Discover, Diner's Club and JCB. There is a $50 minimum for all wholesale orders. Shipping Method - Your order will be shipped to you via United Parcel Services (UPS) in Ground service. If you have a different requirement, please call us at 503-736-0198. Allow 7 to 10 business days for processing and delivery. Please give us a complete street address (UPS does not deliver to post office boxes). If using a rural route number, also include the nearest crossroad in the order notes section. In some cases, we may be able to pack orders for pick up in our retail store, The Leaf Room, 3430 SE Belmont St. Portland, 97214. Customers ordering online from a local zip code will be eligible for this option on the shipping page. When you place your online order, select "Pickup in Leaf Room." You will receive an email notification when order is complete and ready for pick up. Orders typically take 2-3 business days. You may also call the Leaf Room directly to place orders for pick up: (503) 736-0119. The Leaf Room is open from 11am-7pm, 7 days a week. All product concerns must be reported within 7 days of receiving the order. Product will only be accepted if prior notification and approval has been obtained from our National office or one of our service representatives. Product must be returned to us in original packing. For product exchange, the shipping charges will be paid by the customer. You may also call us at 503-736-0198 (Monday thru Friday 9am to 5pm PST) or email us at info@taooftea.com for any additional information needed. The Tao of Tea has created this privacy statement in order to demonstrate our firm commitment to our customers' privacy. The following discloses our information gathering and dissemination practices for this web site. The information collected on this site is only used by The Tao of Tea and is never sold or given to third parties for their use. Registration - Our site's various registration forms require users to give us contact information (such as their name, email, and postal address) and various other information depending on what product or service the user is requesting. For example, when requesting a catalogue we ask for your name and postal address so we can send you the catalogue. Also, you have the option of entering your title, company, phone, fax and email which we use to send catalogues, product, or other information. The customer's contact information is also used to contact the visitor when necessary; for example, if we have a question about your order or request. Our website also offers users the ability to sign up for our newsletter and special offers. Users may opt out of receiving future emailing; see the choice/opt-out section below. Demographic and profile data is also collected at our site. We use this data to tailor the visitors' experiences at our site, showing them content in which they might be interested, and displaying the content according to their preferences. Orders - Our site uses an order form for customers to request information, products, and services. We collect visitors' contact information (their name, email, and postal address), financial information (such as account or credit card numbers), and demographic information (like zipcode, or tea preference). Contact information from the order form is used to send orders to our customers. The customer's contact information is used to get in touch with the visitor when necessary. Users may opt out of receiving future mailings; see the choice/opt-out section below. Financial information that is collected is used to bill the user for products and services. Demographic and profile data is also collected at our site. We use this data to tailor our visitors' experience at our site, showing them content in which they might be interested and displaying the content according to their preferences. Public Forums - This site makes forums, message boards, and/or other interactive functions available to its users. Please remember that any information that is disclosed in these areas becomes public information and you should exercise caution when deciding to disclose your personal information. Security - This site has security measures in place to protect the loss, misuse and alteration of the information under our control. Choice/Opt-Out - This site gives users the following options for removing their information from our database to not receive future communications or to no longer receive our features. You may also request to have your information corrected or updated by contacting us as well. In future updates to the web site you will be able to remove and update your own information. If you have any questions about this privacy statement, the practices of this site, or your dealings with this site, you may contact us at the addresses above. We work directly with all our producers to bring teas to you. There are no middle people involved. This is a result of our work over the last 17 years, since our founding in 1997. We are a company that prides itself in working with the choicest tea leaves. Our focus remains on finding exceptional quality pure leaf teas that have a superior flavor profile and grown without any pesticides or artificial additives. We handle each order with care and personal attention. When you order tea by the bulk, we pack the desired weight into either kraft, tin-tie bags with a moisture barrier, or into foil bags with protective barrier. The hand packing certainly takes extra time, but minimizes any breakage and maintains leaf integrity. It also provides you with greater flexibility in purchasing a quantity of your choosing. Our retail customers can choose to order in one ounce increments. We start processing your order as soon as we receive it. Please allow up to 2-3 business days for the order to be processed completely and before it ships. We ship with UPS Ground service within continental USA or via USPS priority to Hawaii, Alaska and other US territories. The exact time taken via these carriers varies based on your destination. Tracking your order will be able to give you the detailed time schedule. Please note that USPS and FedEx do not include Saturdays, Sundays or Holidays in their delivery time schedule. Once we relinquish our teas to UPS or USPS, the arrival time is beyond our control, however we are always happy to assist in tracking your package. If your order is time sensitive and you want to ensure your tea arrives by a specific date, please contact us at 503.736.0198 and we will help determine the shipping options available. Tea is a seasonal crop. It is only as good as its freshness. At The Tao of Tea, freshness is one of our foremost guiding principles. The spring season in tea is generally April – May. It takes about a month for many of our teas to reach our facilities in Portland. Spring is good for Green teas, and lighter black teas. Summer, June-July, is good for black teas, oolongs and Puer. Fresh tea should have good aroma and a flavorful taste. As tea ages, the leaves dry out and change color to pale shades. Be sure to purchase unblended, single origin teas in the peak of their freshness. Blended teas, with other herbs or natural essences can last much longer and are available throughout the year. Although the barrier lined bags will retain the aroma and leaf integrity within the bag, as soon as the bag is opened, those aromatics are released into the atmosphere. We prefer to strive to provide our customers with the freshest tea possible and encourage you to drink it while it is fresh. We recommend that you store your tea in an airtight container in a cool dark place. Avoid areas with heavy smell or that are overly warm. Also please ensure the container does not have any residual acids from anything that was stored in it previously. We ship to APO addresses. We have a number of customers scattered around the world with APO/FPO/DPO addresses. You can order online and we’ll ship the tea directly to you. Please just be sure to use USPS, not UPS when you place your order. The Tao of Tea does ship products internationally, however we are not set up to do international shipments online at this time. We therefore process most international orders by phone. Feel free to contact us with your billing/shipping addresses and phone number and we'll work up a shipping quote based off your address. We can be reached at 503.736.0198. Shipping is via UPS or USPS. Payment will also be taken by phone. We accept either Visa or MasterCard. We regularly conduct free tea tastings in our Leaf Room. Please call us at 503-736-0198 to find out the weekly schedule. We offer customized programs suited to the individual needs of our wholesale clients. Our products can be found in major specialty and natural foods stores in the United States. We offer tasting samples for our wholesale customers. There is a nominal charge for the samples. We are certified by QAI Inc, for Organic standards at all our facilities. Most of our teas are organic. There are a small portion of teas that are not organic. In such cases, we have taken additional measures to either audit the farming practices of the tea gardens or have confidence through independent lab testing. We do not add any artificial additives to our teas. We do not have any GMO tea. Our teas are mostly composed of Heirloom varietals.